Where do I start? With the Peacock shawl? 3 more rounds worked yesterday—bringing it up to a an even dozen round (of chart 3). Today I'll finish the “stem” part of the chart 3 and begin the base of the feather eye. First lace, (and some increases), then some stocking knit, (and some more increases), then the eye, (and the dreaded 9 stitch increases!) There are decreases after the eye--but there is a net gain in the stitch count, too. The next 2 rounds are the last rounds of the (extended) stem-- the last easy rounds for this chart. I didn't take a photo graph (since three rounds in the same pattern don't really change the look) But maybe by tomorrow, there will be some interesting new parts of the design to look at. The socks? Are taking forever! Remember how I noticed the gauge was tighter? Not so tight they didn't fit. But certainly if I had knit the legs as tight as knit the foot, getting the socks over the heels would have been an issue. The socks look great on LEGS narrower feet--(none of the usually ripples or bagginess)--but they don't stretch out too much on my gunboat sized feet. With a tighter gauge, I need to increase the length of the foot for ease. Last night I stopped at 7.75 inches of foot—which in most cases, would be a tad bit too long. But not with these socks. When I tried them on, they foot portion of the sock was still not long enough. This morning another 6 rounds were needed (over 0.5 inch) and finally--- the foot is done! Well, the foot sans the toe. 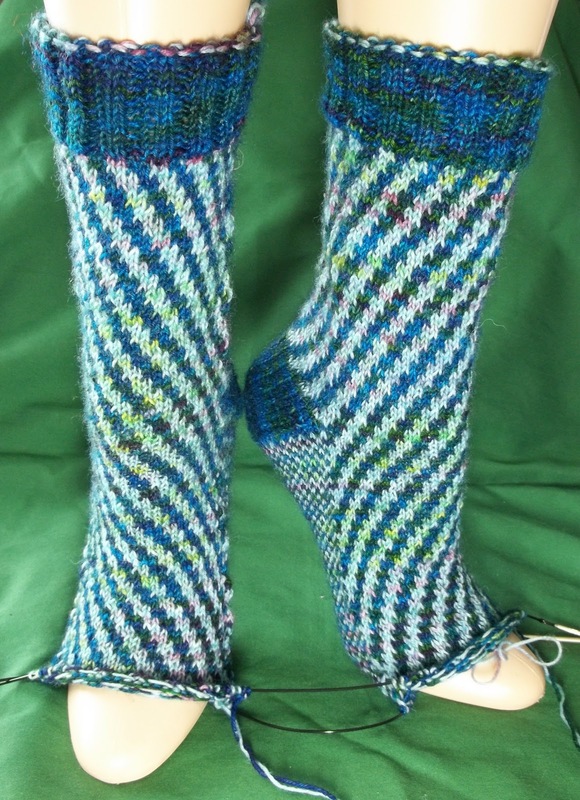 But working the toe is fast—what with every round being shorter, and no color work. Here's how they look now—tomorrow expect to see a finished object! My next socks (secret socks for May) are going to be a single color, with a simple stitch pattern—I have more color work socks planned (for ME! )later this year--and while I love everything about these socks, it will be nice to have a simpler pattern to work on, for a while. Especially as the shawl pattern requires concentration. Mindless knitting is a pleasant task--and at this point, that is what I am looking for in socks. When I tried it on, I decided it was still too long. So another trim to the hem edge—taking off another 2 inches or so. Followed by a quick, rolled and sewn hem. Then a final pressing, and trimming all the loose thread and other minor finishing details--like sewing on the waist band button. White is a somewhat impractical color for casual clothes—but it's what I have to work with. 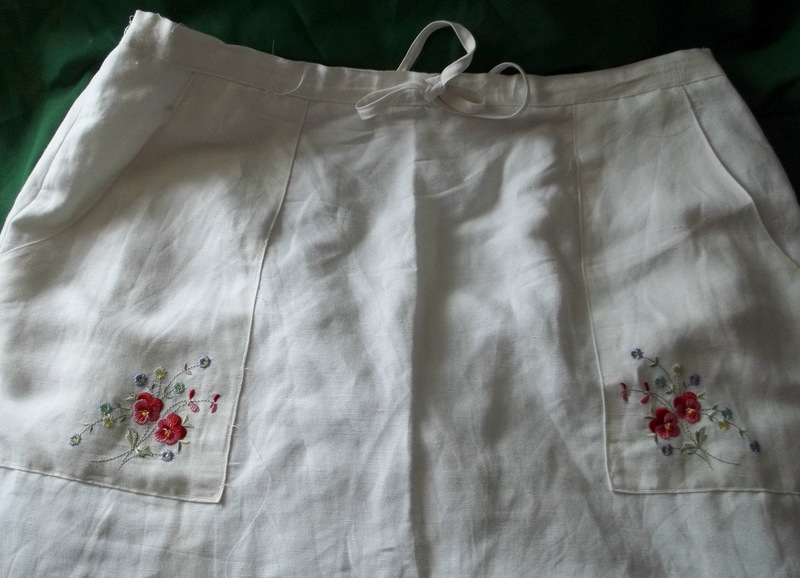 The embroidery detail on the pocket is one I like—it make the skirt fun.